A four-door, four-seat coupe-like sedan with flashes of X6 styling. 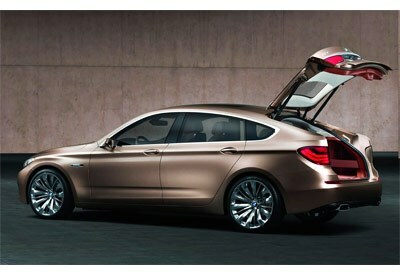 What is it: Described by BMW as a crossover coupe-come sports activity vehicle. Come again? Highlights: Look past the ridiculous rims and pimped chequered interior, and you're looking at the next new niche Beemer. Following Audi's lead, the Bavarian carmaker is filling in the gaps between its standard cars with polarising but possibly successful appeal (like the X6). A rival for the likes of Merc's CLS and the imminent Porsche Panamera, the 5-GT is a four-door, four-seat coupe-like sedan, but with flashes of X6 styling. Like the 3 Series Coupe, the GT has a huge cargo area with rear seats folded - 1650L - and has a split hatch/boot dual-access boot like the Skoda Superb. Australia-bound: We would be surprised if it wasn't in line for production.